Country charm and community spirit abound in this cozy village on Highway 14, one hour east of Edmonton. 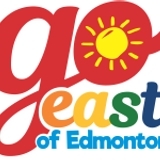 It has lots to offer with annual events and local attractions. 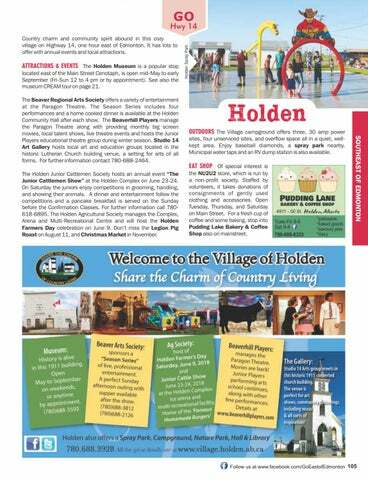 ATTRACTIONS & EVENTS The Holden Museum is a popular stop located east of the Main Street Cenotaph, is open mid-May to early September (Fri-Sun 12 to 4 pm or by appointment). See also the museum CREAM tour on page 21. The Holden Junior Cattlemen Society hosts an annual event “The Junior Cattlemen Show” at the Holden Complex on June 23-24. On Saturday the juniors enjoy competitions in grooming, handling, and showing their animals. A dinner and entertainment follow the competitions and a pancake breakfast is served on the Sunday before the Confirmation Classes. For further information call 780618-6895. The Holden Agricultural Society manages the Complex, Arena and Multi-Recreational Centre and will host the Holden Farmers Day celebration on June 9. Don’t miss the Legion Pig Roast on August 11, and Christmas Market in November. Holden OUTDOORS The Village campground offers three, 30 amp power sites, four unserviced sites, and overflow space all in a quiet, wellkept area. Enjoy baseball diamonds, a spray park nearby. Municipal water taps and an RV dump station is also available. EAT SHOP Of special interest is the NU2U2 store, which is run by a non-profit society. Staffed by volunteers, it takes donations of consignments of gently used clothing and accessories. Open Tuesday, Thursday, and Saturday on Main Street. For a fresh cup of coffee and some baking, stop into Pudding Lake Bakery & Coffee Shop also on mainstreet. The Beaver Regional Arts Society offers a variety of entertainment at the Paragon Theatre. The Season Series includes four performances and a home cooked dinner is available at the Holden Community Hall after each show. The Beaverhill Players manage the Paragon Theatre along with providing monthly big screen movies, local talent shows, live theatre events and hosts the Junior Players educational theatre group during winter season. Studio 14 Art Gallery hosts local art and education groups located in the historic Lutheran Church building venue, a setting for arts of all forms. For further information contact 780-688-2464.